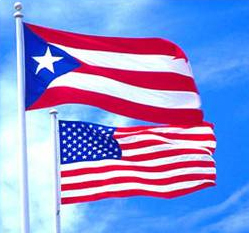 U is for… USA; Puerto Rico’s in America! The largest population of Puerto Rican immigrants in the US proper reside in New York and New Jersey and they’ve definitely had a significant influence on the culture which piqued my interest in wanting to cook Puerto Rican food. I’m one of the few people I know who grew up in this area that has never been to Puerto Rico and I really want that to change soon! (Girls trip anyone?). It is by all accounts a beautiful island with fantastic weather and of course great food. I’m not generally “sit on the beach and relax” kind of gal, but I’ve been told that one of the coolest things about PR is that there’s also a lot of history to explore in Old San Juan which is right up my alley. Also, Ricky Martin… adorable! This recipe took quite a bit of research and leg work. I’ve eaten nothing but fish and vegetarian meals for the last two weeks (Meat Break!) so I knew I wanted a meat based recipe and with this freezing weather we’re having, I also wanted something warm and comforting. 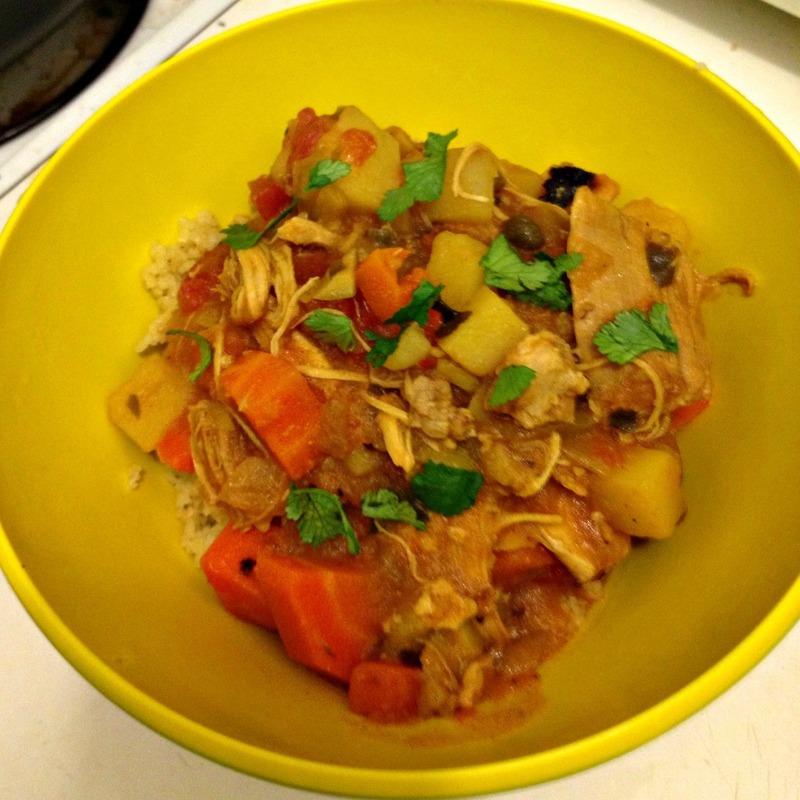 I settled on Pollo Guisado, Puerto Rican braised chicken stew. There were a decent amount of recipes on the internet, but most of them called for various kinds of pre packaged seasoning mixes, like Goya Sazon, which are filled with chemicals and other artificial crap and that’s just not how I cook. So I did a lot of research to try and replicate those flavors with natural ingredients. I think I succeeded for the most part, though as you’ll see in the review, next time I’ll have to kick the spices up even more. Speaking of artificial crap, if you haven’t been reading this blog from the beginning you should just assume that my food is made with mostly organic ingredients and hormone/antibiotic free meat. I’m just too lazy these days to write all that. Heat olive oil in a medium dutch oven and brown chicken on both sides, about 3 minutes a side. Remove chicken and set aside. Add the onions and peppers and cook until they begin to soften, about 3 minutes. Then add the garlic and cook 2-3 more minutes until fragrant. Add the tomatoes, all of the spices and the olives and capers, stir. 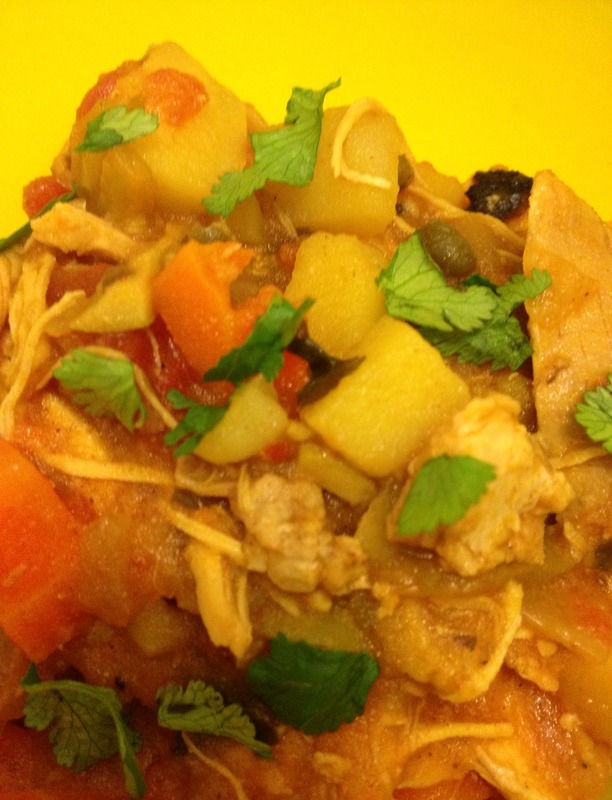 Then add the potatoes and carrots, vinegar, chicken and any accumulated juices. Cover with chicken broth making sure to submerge chicken. Bring to a boil, then lower heat and simmer uncovered for one hour. Add beer and cilantro and continue cooking uncovered for half hour. I had a super hard time grading this recipe because any flaws have to do with my ratios and not the flavors in the dish itself. It smelled great and I loved the combination of all of the spices, but it needed more of those flavors. 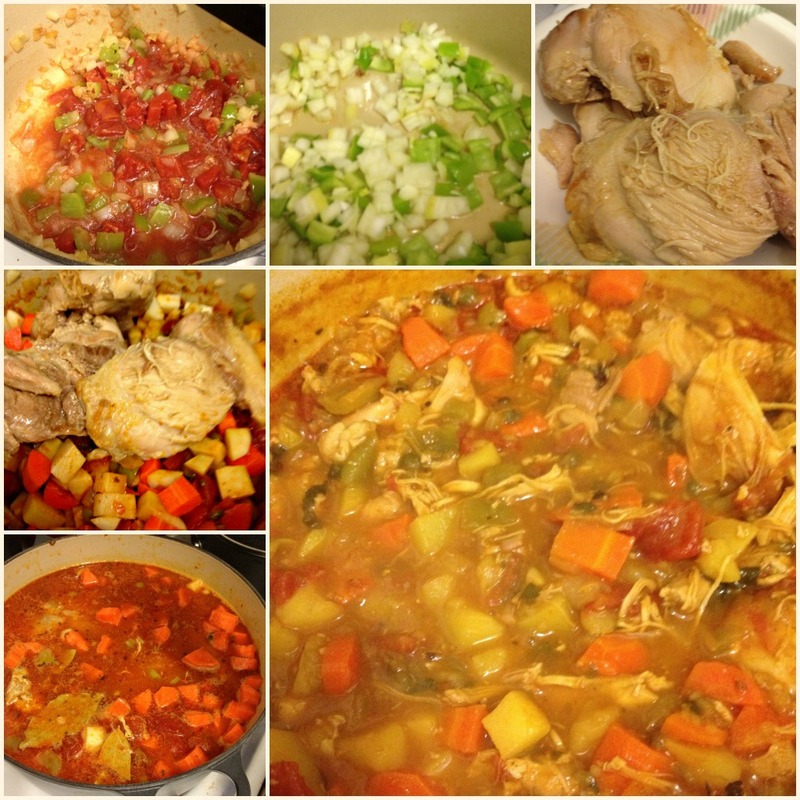 It’s wonderful comfort food, especially on a cold day and I would definitely make this dish again however I am definitely going to up some of the ingredients. If you make this at home my advice is to double all of the spices and garlic and also the olives and capers, which is likely what I’ll do next time. I think with those tweaks this would be a grade A recipe. She is a pretty dish. The idea of a Coca-cola anti-obesity campaign is so laughable it sounds like it should be a story in The Onion. Sadly though, it’s true. Watch this fantastic video, a spoof of the actual Coke commercial, which speaks the truth about soft drinks and their contribution to the obesity epidemic as well as other health problems. I think soda is by and large tastes pretty gross. The only sodas I do like are Root Beer and Ginger Ale. If I had to guess I probably have each of those one to two times a year. If you don’t want to be obese here’s one thing you can do; don’t drink soda every day. Heck, don’t even drink soda once a week. If you like Coke, or any other soda, drink it once in awhile as a treat. That’s right, I DVR General Hospital. Don’t judge. Also AJ Quartemaine is back from the dead. I came home from work on Monday to find that my refrigerator was completely dead. Awesome! I had to throw out pretty much everything in it. The only things I could salvage were 4 oranges and a sweet potato*. The next day while I was at work my Super had some technicians take a look. 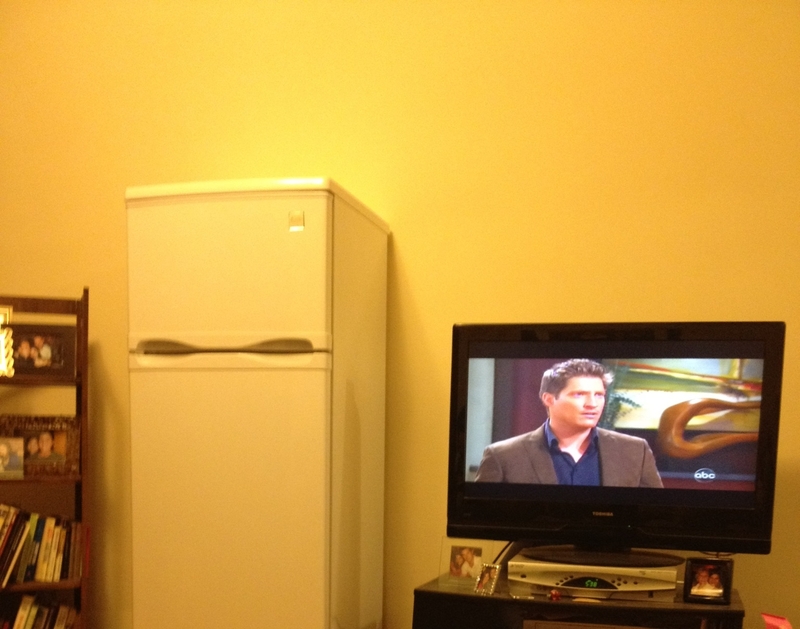 They confirmed that the fridge had left this world for a better place where is can run free with other old appliances. Since it will take about a week to get a new refrigerator in my apartment the Super brought up a temporary one for me to use. Since space is at a premium in my apartment the only place to put it was in the main living area between the TV and bookcase. Stylish, no? I’ve bought the bare minimum of food to keep in the temp fridge and I’m really grateful to my Super for taking care of this so quickly, but man I can’t wait until I have a working fridge in my actual kitchen again! *If you send me an article about how it’s unsafe to consume oranges and sweet potatoes after they’ve been cooled and then come back up to room temperature or something like that, I will find you and I will hurt you. I’m in no mood. At first I thought Rachel Ray, who is NOT a chef (seriously she’s barely a cook… or a sentient being) was winning, but thank God that Michael Symon is actually far ahead. Though my vote is obviously for my hero Mario Batali, especially since my other hero Tom Colicchio was inexplicably left off the list, I am definitely a Micheal Symon fan and he certainly is deserved of this title. Yes, he has an adorable personality and infectious laugh, but he also has chops as a James Beard awarding winning chef and owner of several acclaimed restaurants. Anyway you have the wrote to vote for anyone you’d like, but if you vote for Rachel Ray, Paula Deen or Guy Fieri then we cannot be friends. Sorry. After seeing Anthony Bourdain in Istanbul on No Reservations, there was no doubt that my T recipe would be from Turkey. I literally wanted to try everything Anthony ate and I was so excited that, despite Turkey being the gateway from Europe to the Middle East, there seemed to be very little that I wouldn’t be able to eat due to allergies. I searched and searched for a recipe to make and was overwhelmed (especially when I found this blog) by all the amazing choices. Being a lover of eggplant, lamb and also all things cheesy and smokey; I settled on Hünkar Beğendi, aka Sultan’s Delight. I should say I settled on Sultan’s Delight for now since I know that when I have more time I’m going to go back and cook many of those other Turkish dishes that intrigued me. 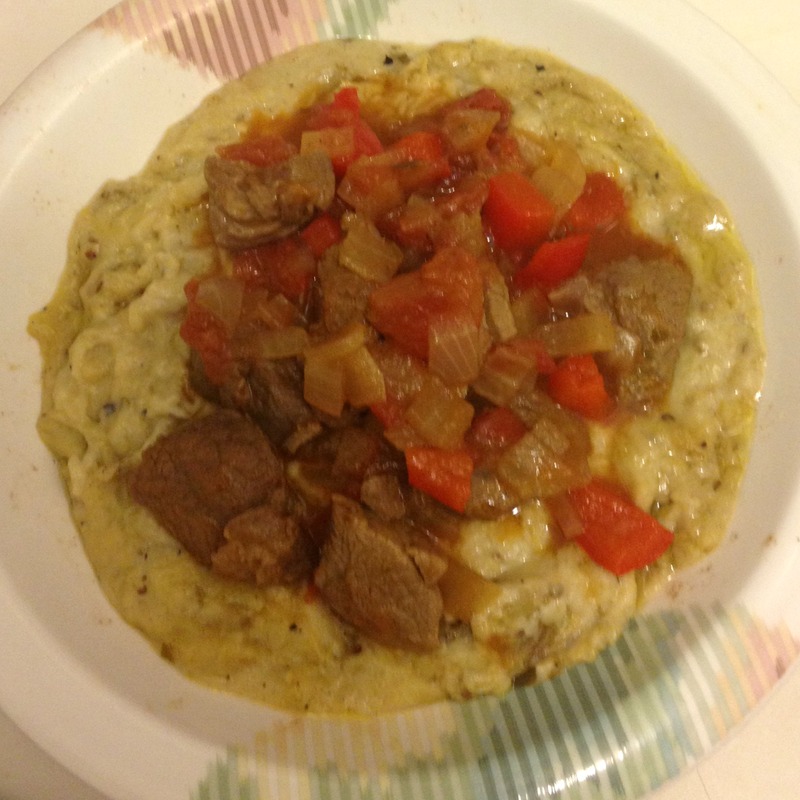 Sultan’s Delight is a lamb stew served over a cheesy, smokey eggplant mash. There is absolutely nothing with that sentence, right? *I had cream that I was trying to use up, but I don’t think the cream is necessary, you can just use 1 1/4 cups whole milk. In a large dutch oven heat oil over medium high heat. Season the lamb meat then brown on all sides then remove to a bowl and set aside. Toss in onions and peppers and cook until they begin to soften about 3-5 minutes. 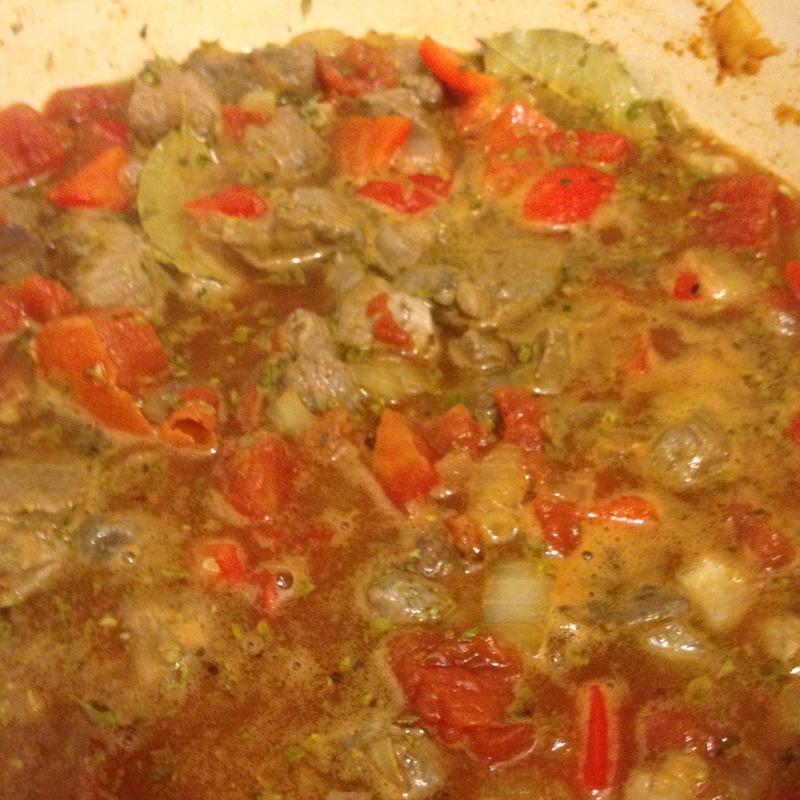 Stir in the tomato paste, diced tomatoes and add the spices and lamb meat back to the pot. Add water and bring to a boil. Lower heat and allow to simmer for one hour. Meanwhile char the eggplant. To do this, first cover the area around the flame of your burner with foil (see picture) because the eggplant will give off water. Preheat the over to 325. Next prick the eggplant all over with a fork. Lay the eggplant directly on to the burner turning periodically until all skin is blackened. 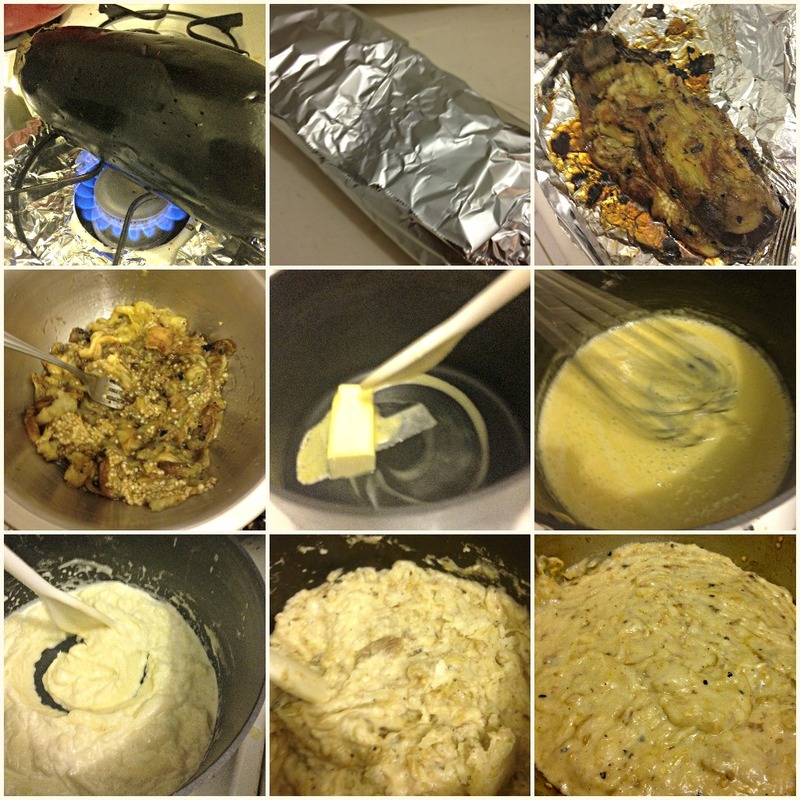 Then wrap the eggplant in tinfoil and bake for 20-25 minutes until very soft. Allow the eggplant to cool, then peel off the skin and mash the flesh in a bowl. Set aside. In a medium pan melt butter. Whisk in flour. Continue stirring for about 2-3 minutes. Slowly whisk in milk and cream making sure to get rid of any lumps. Add the eggplant and stir to incorporate then add the lemon juice and spices. Remove from heat and stir in cheese and nutmeg. Well the smokey cheesy eggplant mash on its own would’ve gotten an A+ and the stew would’ve received an A-, so that averaged out to an A.